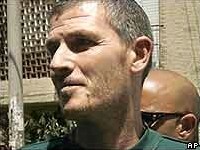 Asher Weisgan (1966 - December 22, 2006) was an Israeli bus driver who shot and killed four Palestinians and injured two others in the West Bank settlement of Shiloh on 17 August 2005. Weisgan wanted to disrupt the Israeli Government's unilateral disengagement plan in Gaza by sparking a Palestinian reaction. Weisgan, who lived in Shvut Rachel, had known two of his targets, Bassam and Usama Tawafsha from the neighbouring Palestinian hillside village of Sanjal, for eight years. Weisgan has said he has no regrets about his actions because they were a 'necessary defence' of the Israeli people. He expressed the hope that Israeli Prime Minister Ariel Sharon would be assassinated. On December 22, 2006, Weisgan committed suicide by hanging himself in prison. The place where the Tawafsha brothers died after a day's work at the Shilo Jewish settlement bears witness to the settlers' futile efforts to save their lives. Used medical equipment lies on the ground amid still-sticky bloodstains near the settlement gate - sterile gloves, scalpels and needles. There is also the affecting sight of what they were carrying when they lost their lives, a half-smoked pack of cigarettes, a shopping bag of Arabic bread. Bassam and Usama Tawafsha were shot in cold blood by a Jewish settler whom they had known for many years, even shared food with. He was giving them a lift home, as he did every day. Two other Palestinians died during Asher Weisgan's shooting spree in the settlement's industrial zone, and another was wounded, before settlement security guards overpowered him. Mark, a security officer who prefers not to give his surname, prevents our entry into the settlement, saying they are on full alert in case Palestinians take revenge for the killings. "I hope that the people around us realise that this is the act of a madman, that it does not reflect Shilo or Shuvat Rachel" (where Asher Weisgan lived), Mark says. "All of our people are incredibly shocked - blown away - by what happened yesterday... These were guys who I knew, who I liked. I considered them my friends." He adds that Shilo's residents were surprised by Weisgan's transformation into a killer - he was a "liberal" settler who did not "harbour any hatred" for Arabs. "I think his mind just snapped, because of the history of violence in the area and because of what they presently call the disengagement," Mark says, referring to Israel's unilateral pull-out from Gaza and four West Bank settlements. It's unusual to find concord between Jewish settlers living on occupied Palestinian land and Palestinians who live nearby - but in the village of Sanjal where the brothers lived a similar picture of Asher Weisgan emerges. The vine-covered veranda of the Tawafsha family home is packed with female relatives, the men milling around in the street or sitting in reception rooms. The men's mother begs for the return of their bodies, which have not yet been released by the Israeli authorities. Usama's wife Aisha, her shocked children huddled around her, calls down revenge on Israel, the settlers and Prime Minister Ariel Sharon. "When one of them kills us they say he is crazy, but if an Arab did that to a settler the whole world is up in arms saying he's a terrorist," Aisha says through her weeping. "They worked with him (Weisgan) for eight years," she continues. "They used to say how decent he was, how they used to eat together, how he used to ask them for our food to take to his wife," she says. "Asher? He was very respectable," says neighbour Ataf Radi, one of a handful of Palestinians who worked at Shilo, but who luckily had not been at work the previous day. "Our relationship with him was far better than you could imagine. No one could have expected this." Among the other mourners on the steep hillside of Sanjal, from where the neat red roofs and elaborate synagogue of Shilo are clearly visible, there is equanimity about the threat they might face from militant settlers in the area. "It could happen anytime," says Ziyad Sabri. "Sometimes they come in the night and attack our homes. You are ready for them, you are not armed like them, but you always have a rock or a stick handy." So what was behind Asher Weisgan's actions? Why did he calmly get out of his car, apparently take a security guard's gun, open fire on his passengers, who considered him a friend, before heading back to the factory and gun down another Arab colleague? Speaking to reporters at his court hearing the day after the killings, he said he wanted to stop the pullout from Gaza, which was in full swing as he spoke. "I am not sorry for what I have done... and I hope someone murders Sharon as well," he said. The Shilo/Shuvat Rachel enclave is isolated in the middle of a sea of Palestinian population and, though the settlers deny it, it is an obvious candidate for future evacuation. His actions have been condemned unconditionally by settler spokesmen - as well as by the Palestinian and Israeli leaderships, who had also condemned the actions of another Israeli settler, Eden Nathan Zaada, who murdered four Israeli Arabs on a Galilee bus less than two weeks earlier. So far these are two isolated incidents - albeit the worst violence so far associated with the evacuation of Gaza, in which the struggle between Jews and Jews has been conducted without violence on both sides. But veteran Haaretz analyst Zeev Schiff called Weisgan and Zaada examples of the "wild grapes produced by Israel's extreme right" of whom "there are many" living in Israel's West Bank settlements. Other examples are the killer of Prime Minister Yitzhak Rabin, Ygal Amir, and Hebron massacre perpetrator Baruch Goldstein. Palestinian militant reaction has so far been muted to the latest provocations, but if any other "wild grapes" ripen during the disengagement, their retaliation could indeed bring about the desired disruption of the withdrawals. An Israeli court Monday convicted a Jewish settler of killing four Palestinians in a West Bank shooting spree last year, part of a bid to stop Israel's pullout from the Gaza Strip. 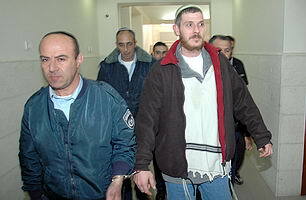 The Jerusalem district court convicted Asher Weisgan of killing the Palestinian laborers on Aug. 17, 2005, the day Israel began forcibly evacuating settlers from Gaza. Weisgan was found guilty of murder, attempted murder and serious attempt to harm, prosecutors said. He will be sentenced soon, a court official said. Weisgan, a driver, had taken several workers to jobs in Shiloh, a West Bank settlement. Once there, he opened fire on them, killing two. Later he opened fire on other laborers in Shiloh's industrial park, killing two more, before being overpowered. "The preservation of life is not done through the spilling of blood," the panel of three judges said in its ruling. Prosecutors said Weisgan had hoped the attack would stop the pullout by forcing the redeployment of Israeli troops from Gaza to the West Bank to quell unrest. Israel completed the withdrawal of its troops and more than 8,500 settlers from Gaza in mid-September 2005, ending 38 years of occupation.